Happy 2019! We wish you and your family a New Year of great health and great satisfaction and fruitfulness in your pursuits and endeavours this year! 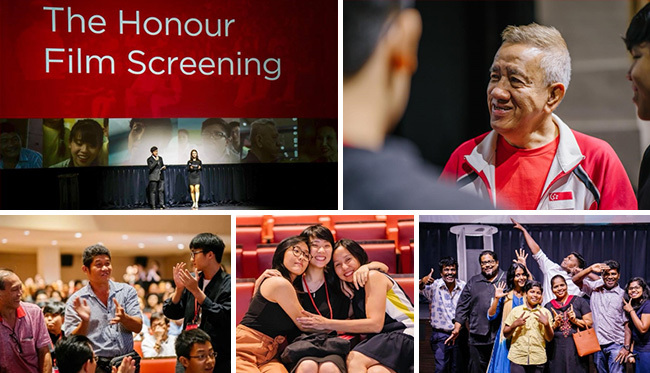 The team at Honour (Singapore) remains steadfast and committed to promoting a culture of Honour and Honouring for the long-term success of Singaporeans and Singapore, whether it be in personal lives or in business and society. Thank you for your support and encouragement as we persevere in our efforts to share the importance of Honour for the well-being of our nation. This quarterly newsletter serves to provide you with an update on the key events. Honour Film Initiative: We continue to support young-adult filmmakers and student filmmakers from Ngee Ann Polytechnic in producing short films and documentaries on the theme of Honour and Honouring, starting with honouring the invisible people, and now moving to the larger theme of honouring each other in making a gracious society. Our films have garnered around eight million cumulative online views with numerous positive and encouraging comments. Honour Learning Journey: Since the introduction of our Honour Learning Journey Programme in 2016, we have connected with some 18 schools and reached out to over 4,500 students and 90 educators. Through the highly energised facilitated sessions, the students were able to better understand the importance of Honour for work and life, and gained practical insights on ways of living it out in their own lives. If you are an educator and you would like to explore the use of our films in values education, please get in touch with us at admin@honour.sg. HONOUR IN ACTION: Honour (Singapore) is working on a pilot programme we tentatively call HONOUR IN ACTION, where the practice of Honour, in its multiplicity of expressions, may become a natural part of the way we live and the way we are. If being a Gracious Society becomes a dominant characteristic of Singapore, we would be mining the “HIDDEN WEALTH OF SINGAPORE” where the quality of relationships among the people will enhance both economic growth as well as establish a social environment conducive to every child and every Singaporean developing their talents and abilities the best way possible. This idea is well described by David Halpern in his book “The Hidden Wealth of Nations” (Polity Press). Such a work of social transformation may take a generation, which is why we need people with the vision, resilience, patience and conviction to come on the journey. If you are a school leader and would like to participate in the pilot programme, please write me at LimSiongGuan@honour.sg to express your interest. CEO Forum: The CEO Forum is a periodic forum that we organise to bring together leaders of organisations, big and small, to share perspectives on Honour and discuss how Honour could be beneficial to their organisations and businesses. Our next Forums will be held on 11 APR 2019 and 26 SEP 2019. If you are a CEO and would like to attend one of these forums, please get in touch with me at LimSiongGuan@honour.sg to express your interest. Honour Champions Community: We welcome all who are prepared and convicted to lead as Honour Champions in their respective organisations and other spheres of influence, to contact us so we can meet to discuss how by coming together with other like-minded persons in “Chapters”, you would be able to benefit from each other’s experiences and thereby accelerate the practice of Honour. There is already a community of founder CEOs doing this, inspiring and encouraging each other as they do so. We believe that the culture of Honour promoted through Honour Champions and Honour Ambassadors is critical for the long-term survival and success of our businesses and families, and our effectiveness as leaders and workers. On 3rd December 2018, the Honour Champions from the first such Chapter successfully organised their 1st public event where I spoke to some 130 guests on the topic The Future of Leadership followed by a lively and engaging discussion. I would like to personally thank the organising team for their enthusiasm, energy, conviction and hard work in moving this initiative forward. If you are keen to be involved, please let us know at admin@honour.sg. Talks: I continue to speak about Honour, on an invitation-only basis, at schools, companies, and community groups. If you believe such a session could be a boost to the vision and morale of the people in your sphere of influence, do let me know at LimSiongGuan@honour.sg. Thank you once again for your support, encouragement and believe in our cause as we continue to promote a culture of Honour and Honouring for the well-being of Singapore. We look forward to your continued support and partnership in 2019. If you can support our efforts financially, donations of any size will always be welcome and deeply appreciated. As Honour (Singapore) is a charity with the status of an Institution of Public Character, all donations from individuals as well as corporate organisations will enjoy enhanced tax deduction. I look forward to hearing your ideas and feedback on how we might be able to do things better. Please get in touch with me at LimSiongGuan@honour.sg. Wishing one and all a Happy New Year! May we not be thwarted by the uncertainties of the future, but instead strengthen our confidence for long-term success by seeking always to do what is good and right in the spirit of Honour.